Aloe vera is a species of succulent plant that probably originated in northern Africa. The species does not have any naturally occurring populations, although closely related aloes do occur in northern Africa.The species is frequently cited as being used in herbal medicine since the beginning of the first century AD. Extracts from A. vera are widely used in the cosmetics and alternative medicine industries, being marketed as variously having rejuvenating, healing or soothing properties.There is, however, little scientific evidence of the effectiveness or safety of A. vera extracts for either cosmetic or medicinal purposes, and what positive evidence is available is frequently contradicted by other studies.Despite these limitations, there is some preliminary evidence that A. vera extracts may be useful in the treatment of diabetes and elevated blood lipids in humans.These positive effects are thought to be due to the presence of compounds such as mannans, anthraquinones and lectins. Aloe vera is a stemless or very short-stemmed succulent plant growing to 60–100 cm (24–39 in) tall, spreading by offsets. The leaves are thick and fleshy, green to grey-green, with some varieties showing white flecks on the upper and lower stem surfaces.The margin of the leaf is serrated and has small white teeth. The flowers are produced in summer on a spike up to 90 cm (35 in) tall, each flower being pendulous, with a yellow tubular corolla 2–3 cm (0.8–1.2 in) long.Like other Aloe species, Aloe vera forms arbuscular mycorrhiza, a symbiosis that allows the plant better access to mineral nutrients in soil. Scientific evidence for the cosmetic and therapeutic effectiveness of aloe vera is limited and when present is frequently contradictory.Despite this, the cosmetic and alternative medicine industries regularly make claims regarding the soothing, moisturizing, and healing properties of aloe vera, especially via Internet advertising.Aloe vera gel is used as an ingredient in commercially available lotions, yogurt, beverages, and some desserts. 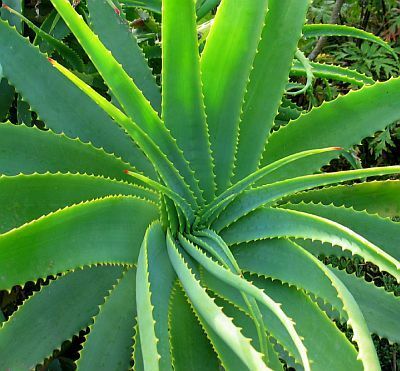 Aloe vera leaves contain a range of biologically active compounds, the best-studied being acetylated mannans, polymannans, anthraquinone C-glycosides, anthrones and anthraquinones, and various lectins.